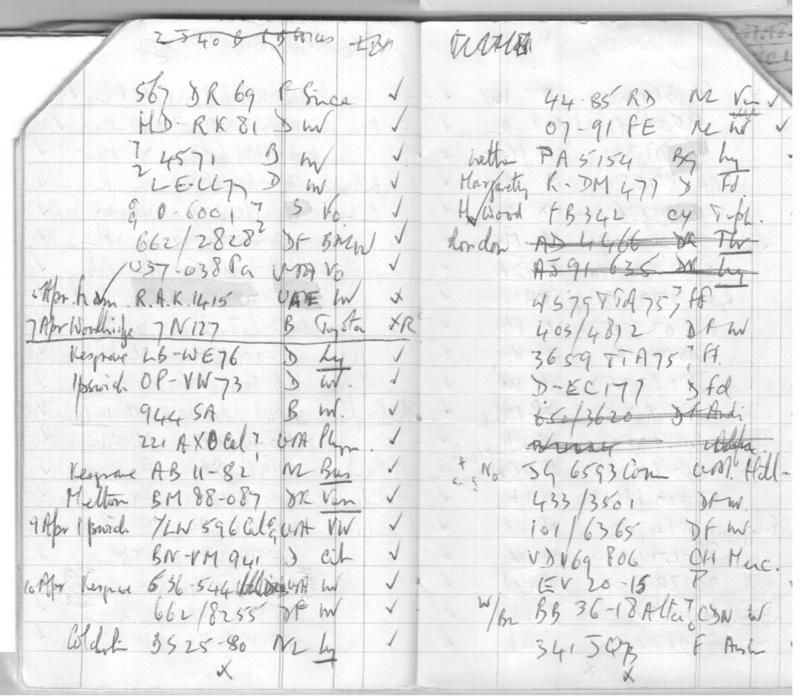 Below we see one of the 40 spotting books employed by EU member John Pemberton between 1955 and today. He religiously noted everything foreign which came his way, mostly spotting in the East of England, in Suffolk, Norfolk and on occasional visits to London and the near Continent. He would not take note of Belgians in Germany, or Germans in Holland, as there were too many to record, and he wasn’t interested in noting foreign forces plates in Europe or Britain, unless they bore normal plates from their place or registration. An exception was made for the many SHAFE/SHAPE plates he noted, from Supreme HQ – Allied Forces/Powers-Europe. And as with many of us, he may not have known that Spanish plates which bore a zero in the fourth numeric position from the right, were allocated to US Forces, Spain, because he has recorded a great number of them! e.g. It becomes clear from analysing JP’s spottings, that the earlier the period, the more varied and unusual were the cars to be seen in circulation. A day out in 1956 could garner a spotter vehicles from Ceylon, Nigeria, Cyprus, India, British Guiana, Formosa, Japan and the Straits Settlements. To see any one of those in 2012, would be the high spot of a collector’s year! His recent books (say, from 1980 to current) are still testament to John’s determined notation, but these modern sightings are all European plates, with rare exceptions. Items which strike the writer, while cataloguing the longhand archive, are the surprisingly high number of vehicles from Algeria and Morocco, both before and after independence from France, the 10(?) cars he saw from Bermuda (though I never saw one in 55 years of spotting (well, one on Grand Turk years ago) and quite a few from Angola and Swaziland – very rare indeed. He has captured the only known photo of British Somaliland on a car also bearing the SP oval representing the Somaliland Protectorate. 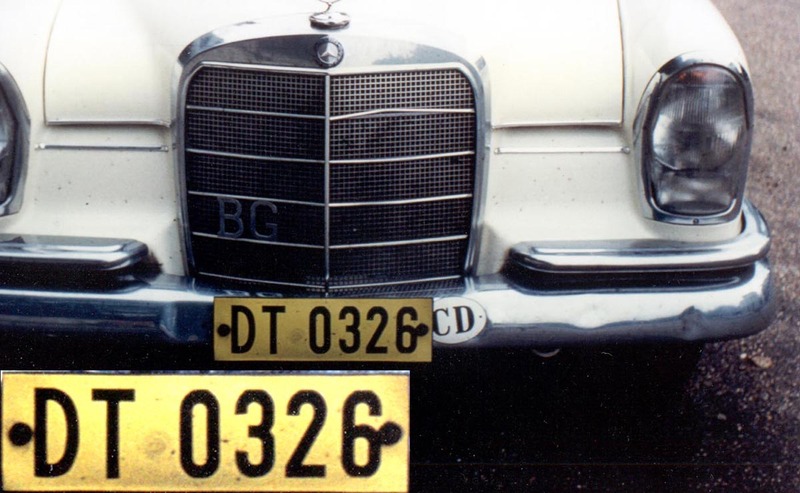 Similarly John has photographed the only known SM oval, the former code for Siam – and on a German HANOMAG car in Copenhagen, bizarrely, in the late 1940s…. I has been amusing for me to recognise some parallel spotting between John’s notes and my own photo archive. At least a dozen plates which he noted forty five years ago were captured for posterity in photographs I must have taken in the same period in which he saw them, although we were 200 km. apart and knew nothing of each other! Here are two of them. 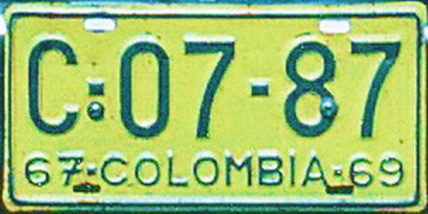 The Bulgarian diplomatic DT 0326 lived in Notting Hill in London for perhaps four years without changing these rare plates, and was also seen and photographed by members Terry Gray and Ivan Thornley. This was the 1967-85 CD series. 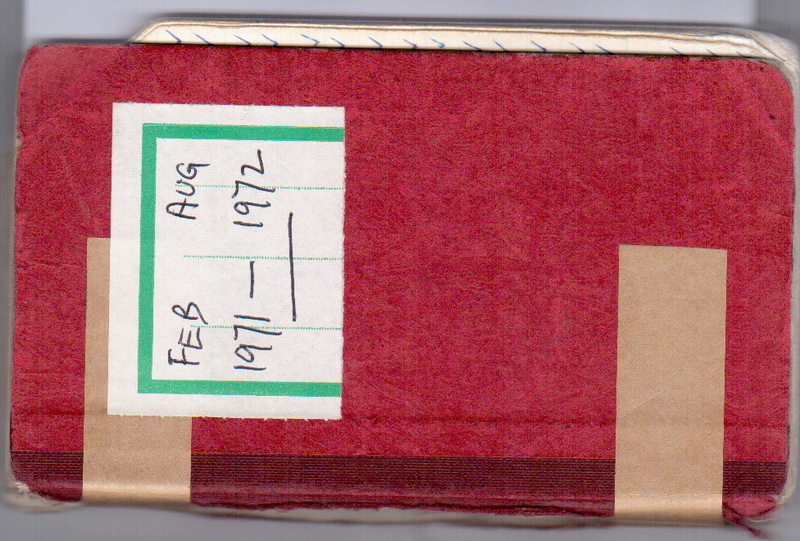 A great archive, which I hope will bring some happy moments to all who inspect the pages of the précis which will now be progressively published in the Blog as a Google spreadsheet document, as I work my way forward through the booklets. NOTE DATED 18 AUG. NOW STRUGGLING TO CONVERT THE ORIGINAL XLS SPREADSHEETS TO GOOGLE SPREADSHEETS SO THAT THEY CAN BE SHOWN HERE: WORK IN PROGRESS AGAIN! Some of John’s script resembles Farsi or Sanskrit – but usually turns out to represent the word ‘London’ or ‘July’ or ‘ blue Peugeot’. The orthographic decoding only held up the production of the typed form by a few months…….! Here is the first of John Pemberton’s distilled (redacted?) spottings, from the earliest books he can find, dated 1955 and ’56: ********* Feb. 11 2014 addendum —Technical snags have prevented the insertion of this file, but now it has been converted to a Google.doc, which you can read on-screen, or download to inspect at your leisure. In a few days, it will be inserted HERE. This entry was posted on Sunday, August 18th, 2013 at 5:16 pm and is filed under Uncategorized. You can follow any responses to this entry through the RSS 2.0 feed. You can leave a response, or trackback from your own site.